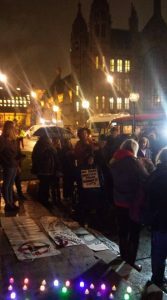 The first ever DPAC protest in October 2010 saw campaigners march through Birmingham in the pouring rain. We were drenched, soggy, and our wonderful banner that co-founder Tina Hogg had made was destroyed by the deluge. 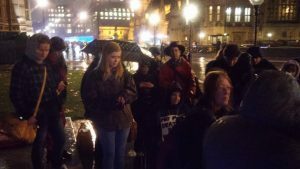 And once again November 16th 2016 we gathered in the pouring rain to pay tribute to the life and work of another co-founder Debbie Jolly and also to demand that the Tories act on the 11 recommendations in the report released last week proving the grave and systematic violation of our human rights by their actions. 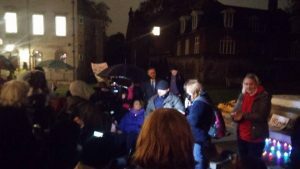 Thanks to all who came and stayed in spite of the rain and cold. Thank you also to all those who were unable to but sent good wishes. Thanks also to all of you who have made a donation to DPAC as requested by her family instead of sending cards and flowers. Thanks also to all of you who would but can’t afford to. Part of the things Debbie wanted and fought for were a sustainable income for all disabled people. Somewhat unbelievably the Tory Minister for Disabled People, Health and Work (Penny Mordaunt) also said “May I associate myself with the sentiments expressed by the shadow Chancellor about the late Debbie Jolly? She was a noted researcher and sociologist, as well as a tireless campaigner. I am sure that our comments will be just two of the many tributes that will be paid to her.” Well what can you say apart from they’ll jump on any bandwagon if they think it’ll benefit them. Please sign and share this petition to try to get a debate in parliament about the UN inquiry and all 11 recommendations to be implemented. It needs 100,000 signatories to be considered. As an activist with OCAP living in Toronto, Canada (on a disability pension increasingly subject to austerity) I’ve followed & been inspired by the actions of DPAC since I learned of it not long after its inception, and after members of DPAC came here to speak & visit with us. Despite never meeting or communicating It really saddened me to learn of Debbie’s death – an amazing human being! As they say in Latin American communities, it should be said of Debbie ‘Presente’ – she is still in attendance, will always be so, having so positively left her mark on communities which extends around the world as my writing of this attests!